PHIL NELSON is an artist manager and music business educator. He has worked as an artist manager since 1988 with his current clients including Grammy-winning Matt Hales (aka Aqualung), platinum-selling Duke Special and Mercury-nominated Sweet Billy Pilgrim. Previous clients include The Longpigs and The Levellers, the latter of whom pioneered the direct-to-fan approach that is now industry standard and – after headlining Glastonbury – worked with Phil to launch their own 15,000 capacity festival Beautiful Days, which continues to this day. Throughout his artist management career, Phil has also played an active role in the wider music industry. He was Vice Chair of the Music Managers’ Forum from 1997 to 2007, he co-founded The Great Escape showcase festival in Brighton with Martin Elbourne and Jon McIldowie, and along the way dreamed up the Breakers Chart for Music Week. Phil is also an experienced educator, currently teaching music business at BIMM. From 2016 to 2018, he was also Music Industry Ambassador for the BIMM Group of colleges, developing programmes that offered students hands-on music business experience and opportunities to network with the industry. This included setting up the Appetite For Disruption student conference and the student-run record label Pool Valley Recordings, as well as facilitating numerous ‘real world projects’ for BIMM’s dissertation students. In 2017 he co-programmed and co-hosted a full-day education strand as part of the CMU conference at The Great Escape, which aimed to bring together music educators with the music industry, seeking to strengthen the link between music education and music careers. He has now co-founded the music education consultancy Pathways Into Music with CMU MD Chris Cooke. 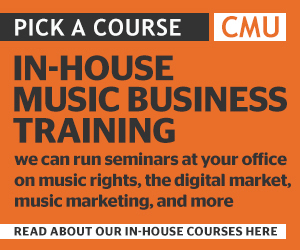 This company will likewise link music education and the music industry through a major research project called ‘Redefining Music Education’, future editions of the music education conference, and a new series of seminars aimed at those who teach, advise and support early-career artists and future music industry talent. Phil is leading on the ‘Redefining Music Education’ research project, and is currently focused on mapping music education provision and the local music industry across the UK, region by region. Through this work, Chris co-programmed and co-hosted a full-day conference strand on music education at The Great Escape in 2018 and help initiate the major research project ‘Redefining Music Education’, both seeking to build stronger links between music education and the music industry. This has led to him co-founding a new music education consultancy with artist manager Phil Nelson, Pathways Into Music, which will build those links through research, resources, events and training.